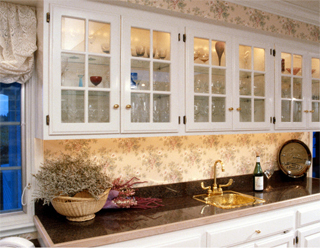 Cabinet hardware can completely change the look of your kitchen or bath. Like home décor accessories, changing or updating your cabinet hardware can give you a fresh new look without spending thousands of dollars. In fact, it’s the least expensive thing you can do to update your kitchen or bath! The purpose of cabinet hardware, other than for decorative purposes, is to keep the oils in your hands from damaging the finish on cabinet fronts. 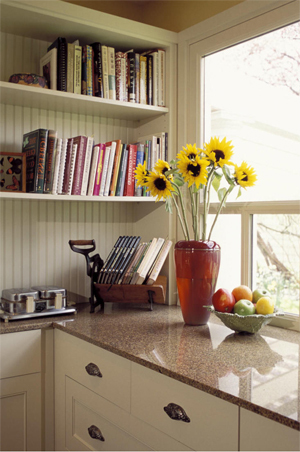 Whether you decide to use knobs or pulls, the purpose is to assist in opening or grasping cabinet doors or drawers. Your cabinet hardware choice needs to compliment the style of your kitchen or bath, but most importantly suit your personality. If you are remodeling and have holes already drilled for existing cabinet hardware, the new hardware must have the same hole configuration or the new hardware must be able to cover up the existing holes. When purchasing new cabinet hardware, often the screws in the package are no long enough to go through the entire cabinet face front. Longer screws are available for purchase separately. Most cabinet hardware is made from the following materials: brass, zinc die-cast, aluminum, steel, wood, plastic, acrylic, crystal, ceramic and porcelain. Not all hinges are made in all finishes. Cabinet hardware is available in many different styles. Examples are: decorative, functional, storage, bath and appliance handles. Categories of cabinet hardware include knobs and pulls. Knobs generally have one hole and pulls have 2 holes. Knobs and pulls can be used on doors and drawers, but they can also be mixed. Typically when mixing knobs and pulls, knobs are installed on the doors and pulls are installed on the drawers. The position and height of the hardware is completely dependant on what feels right and works best for you. Some prefer to install knobs in the upper corner of the cabinet door, some prefer the knob to be lower down the door than the corner. Some knobs can be installed in the middle of the door for a furniture look. Backplates can be installed behind a cabinet knob or pull for a specific look or for further protection of the cabinet face. Most people choose 1 style knob and/or pull, but there is no design law against mixing more than 1 style or type. For example, the island in a kitchen can have a completely different color or style hardware, especially if the island is a contrasting color to the other cabinets in the kitchen. A separate style hardware can also be used on cabinets that are intended to look like a separate piece of furniture. There are 3 basic door types. This information is important when determining what type of hinges you need. Flush- door is inset into the frame so the door and frame are flush with each other. Inset – part of the door insets into the frame and part overlays the door. In other words, the back of the door is routed out around the edge, usually 3/8" by 3/8". Overlay- the back of the door is flat and it overlays the frame. Types of hinges - Hinges may be hidden, self closing or shown to be part of the look of the kitchen or bath. With flush hinges or full inset hinges both the wings and the hinge are attached to the inner sides of the cabinet and door with the knuckle and pin showing on the outside. Overlay hinges are designed to be used with frameless cabinets and overlay doors. These are designed to be more functional than decorative. Wrap hinges are designed for use with partial overlay doors. They are designed so that only the knuckle and the pin of the hinge show when the door is closed. Face frame hinges or face mount hinges are partially concealed. The frame wing of the hinge is visible on the front of the frame. The knuckle and the pin are also visible. Many self closing hinges are of this type. Surface mount hinges offer the most decorative options because both the frame wing and the door wing of the hinge are visible on the outside of the cabinet. Self closing hinges offer a knuckle and pin mechanism that produce a self closing effect. The technology can be applied to a variety of configurations of the door and frame wings of the hinge. When needed, decorative cabinet hardware can be cleaned with warm water, mild soap and a soft cloth. Drawer slides simply need to be wiped with a soft cloth. The slides comes pre-greased for optimal operation so when cleaning, be sure not to wipe off the grease. Hinges are virtually maintenance free if they are not exposed to extreme temperatures, chemicals or solvents, excessive dirt, saw dust or any other staining material. They only need to be wiped down with a soft cloth. With frequent use, cabinet knobs can become loose. Periodically tightening the screw from the back can help avoid this problem.